You probably knew this was coming. In the wake of this and this, we just had to do a book for lovers. So grab your partner and ask ’em to indulge you. Here’s five little questions for couples!! Suppose you could take any one thing away from your lover. Any bad feeling they’re stuck with. So go ahead. Swoop in and save the day. What one thing are you taking away from them that they’ll never have to deal with again? “Fine” – The argument is over. You lost. She won. Imagine tomorrow you and your lover wake up on a warm, sunny day. Where are you two going and what are you doing there? Imagine you have the power to give your lover a gift. It doesn’t matter. There are no boundaries. What one gift do you give them? 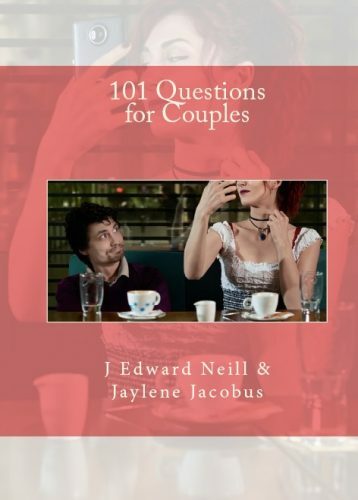 101 Questions for Couples, by Jaylene Jacobus and J Edward Neill, is now available. Tagged compatibility, Couples Quiz, get to know each other, How good are you together, Love Questions. It’s nice to take a little break from deep, dark fiction and publish something lighthearted.